I loooove me some tea-hot tea in the mornings and of course being a Southern girl I love iced tea! 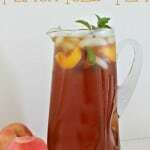 It’s so fun for me to change up the flavors of my iced tea as the year goes on and different fruits come in to season-like the Strawberry Iced Tea I shared with you earlier this year. 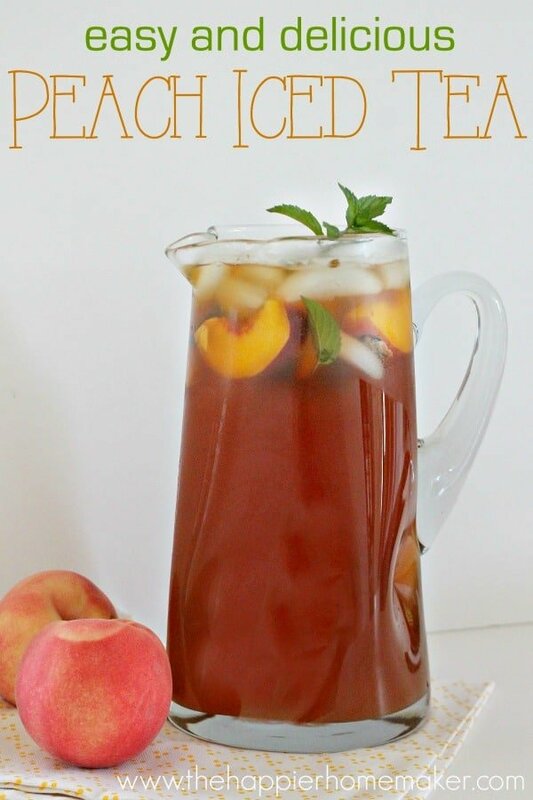 Of course peaches are in season right now and I couldn’t resist whipping up some peach iced tea to share with you all! 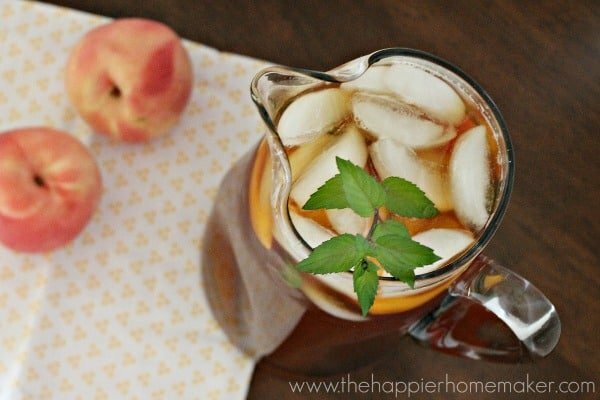 This refreshing summer peach tea is easy to make and the perfect summer refreshment! In a glass measuring dish add two large tea bags to 2 cups of water and microwave 3 minutes. Allow to rest 5 additional minutes. Puree two peaches and strain through cheese cloth or fine mesh to remove pulp. Muddle mint leaves to release flavor and add to 1/2 gallon pitcher. Add 2 cups of ice, peach juice, hot tea and cold water to fill half gallon pitcher. Sweeten to taste with sugar or simple syrup if desired. Serve cold and garnished with mint and extra sliced peaches if desired. I drink my tea unsweetened (family history of diabetes had me cutting out a lot of daily sugar years ago!) but if you prefer sweetened I’d start with 1/3 cup of sugar mixed with the hot tea and adjust to taste. You can use simple syrup too. If you want to try this recipe when peaches aren’t in season substitute 1/3 cup of peach nectar, found in the juice aisle of the grocery store. Do you love flavored teas? What kind is your favorite? I am totally sold – LOVE the peach puree and addition of mint! Definitely agree that the addition of mint + peach puree is genius! What a perfect summer drink. I found you through Creativity Unleashed link party. If you get a chance to stop by my blog sometime, I’d love it! Have a great weekend! question: why do you microwave the teabags? Are you meaning to say microwave teabags in water? If so, how much? How much cold water to add to the recipe when combining everything? yes, I’m so sorry Kat, I’ve updated the post to indicate that you microwave the teabags in 2 cups of water and then add water to fill a half gallon. Thank you for asking, I’m sorry for any confusion! Sounds like a great tea recipe. But fo uou have one for raspberry ice tea???? That is my very favorite, and I haven’t found a good recipe yet. Would appreciate your help.